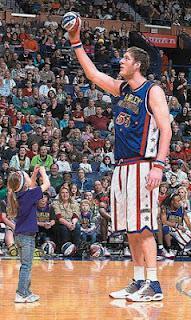 (New York, June 7, 2012) - At seven feet, eight inches tall, Harlem Globetrotters rookie sensation Tiny Sturgess has already been acknowledged as the tallest professional basketball player in the world by Guiness World Records. Now, the 24-year-old native of Loughborough, England might be the world's tallest golfer. Tiny - along with fellow Harlem Globetrotter Special K Daley - took to the driving range at The Golf Club at Chelsea Piers to try out a new set of custom clubs manufactured by Piranha Golf, an Australian-based premium golf equipment developer. Sturgess, who was drafted by the Globetrotters last June out of Mountain State University (W.Va.), owns a single-digit golf handicap and consistently drives a golf ball 300 yards, boasting a personal best drive of over 360 yards. He took up golf as an 11-year old before he hit his growth spurt, growing a foot between the ages of 16 and 17. Finding size 20 shoes to wear daily is not the easiest task for Sturgess, so one can imagine that finding clubs to fit a person who stands 7'8" can be very challenging. "I have a very old set of clubs back in England, but I am very excited about my new clubs and the chance to go out and elevate my game," said Sturgess. "People often doubt that I am a good golfer, so I was anxious to receive my new custom clubs. Now I can show folks what I can do on the course." Sturgess has already received invites to golf with broadcasting legend Dan Patrick of "The Dan Patrick Show," and Boomer Esiason and Craig Carton of the popular "Boomer and Carton in the Morning" radio talk show, and he has inquiries from several celebrity golf events. Presenting Tiny with his custom clubs was Piranha Golf Chairman Antonia Gelonesi who came from Sydney, Australia to personally make the presentation.